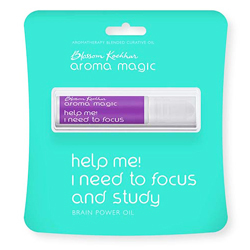 Buy Aroma Magic Help Me! I need to focus and study - Brain Power Oil - Bringing Clarity & Concentration. An aromatherapy formulation made from essential oils of peppermint, rosemary, lavender and basil. Potent blend of pure and natural oils helps in bringing clarity and concentration. Your mind will be at ease as you gather composure to get back on your game. Safe and natural with no side effects.